Within a natural amphitheatre, with the limestone Menoreh Hills rising gently behind and just a one hour drive from Yogykarta, Amanjiwo rests peacefully in the rural heartland of Java overlooking the 9th century Buddhist sanctuary of Borobudur, a UNESCO World Heritage Site. The Restaurant, with its silver-leaf ceiling, looks out onto the crescent-shaped Terrace featuring black terrazzo tables and silver-painted rattan chairs with batik cushions, but the view over rice fields to Borobudur and its surrounding volcanoes takes centre stage. Indonesian and Western cuisines are served in these dining venues, but the specialty of the house is Makan Malam, a series of classic Javanese dishes served in traditional brass bowls. The view from The Terrace is particularly arresting at dawn and dusk with Borobudur directly ahead of the resort. Amanjiwo provides an ideal base for discovery in Central Java – allowing guests to explore the region’s unique culture, centuries-old temples, vibrant markets, natural beauty and colourful festivals. The rural villages of Central Java close to the resort host frequent celebrations with gamelan music and spirited dancing, whether a local wedding or a harvest celebration, they are colourful spectacles not to be missed.The 9th-century sanctuary of Borobudur is a pleasant walk or bicycle ride from Amanjiwo. Borobudur is best seen at dawn, when the air is fresh and full of birdsong. As the mist begins to lift, the sun scales the surrounding volcanoes and terraced fields, and highlights the stone reliefs and the many faces of Buddha. Both a shrine to Lord Buddha and a place for Buddhist pilgrimage, Borobudur comprises six square platforms topped by three circular platforms, and is decorated with 2,672 relief panels and 504 life-size Buddha statues, each sculpted from a single stone. 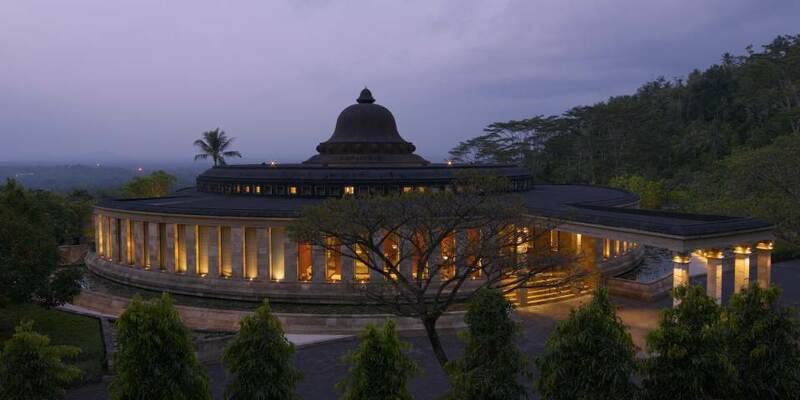 The monument occupies a modest plateau and from the top gallery, beautiful views of Central Java are revealed. Glimpsing Borobudur for the first time is often a deeply felt emotional experience. 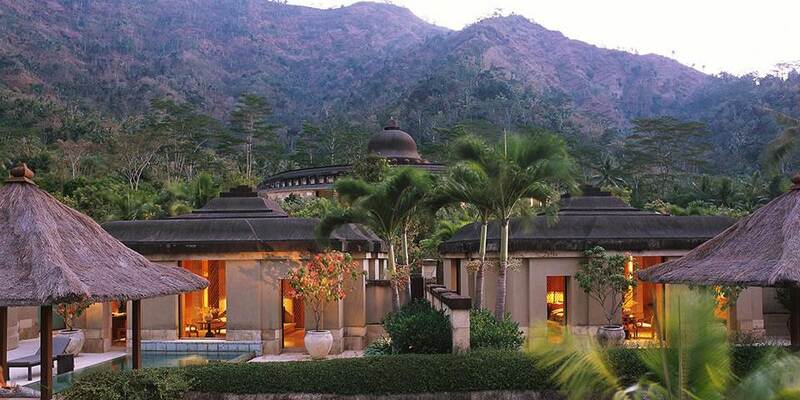 After a day of exploration return to the calm of Amanjiwo to relax by the 40 metre infinity pool, work out in the gym or play a game of tennis, if all this is too active the library, with its daybeds, CD’s and games is a quiet place to relax. For the ultimate in relaxation a range of Javanese and traditional beauty treatments, including facials, massages and cream baths may be enjoyed in the privacy of guest suites or in the specially designed spa suite which features twin massage tables and an outdoor bale for relaxing afterwards. 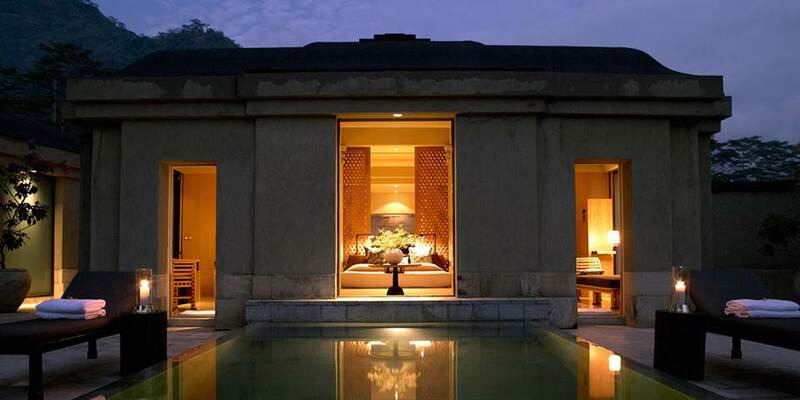 Amanjiwo’s main building is framed by 36 suites set in two graceful crescents around the central Rotunda. Limestone walls give shape to stone walkways that link the suites to the main building, the swimming pool and the Dalem Jiwo Suite. All suites feature terrazzo flooring, high ceilings, domed roofs and sliding glass doors that open to a garden terrace with a thatched-roof bale and daybed for outdoor lounging and dining. Interiors include a central four-pillar bed on a raised terrazzo platform, sungkai wood screens, coconut wood and rattan furniture, old batik pillows in classic Yogyakarta style and traditional glass paintings. The bathroom, which runs the length of each suite, includes twin terrazzo-finished vanities and dressing areas and a sunken outdoor bathtub set in a walled garden. The 10 Garden suites have views over the terraced farmland and Menoreh Hill beyond, while the 10 Borobudur suites look out to the valley and Borobudur. 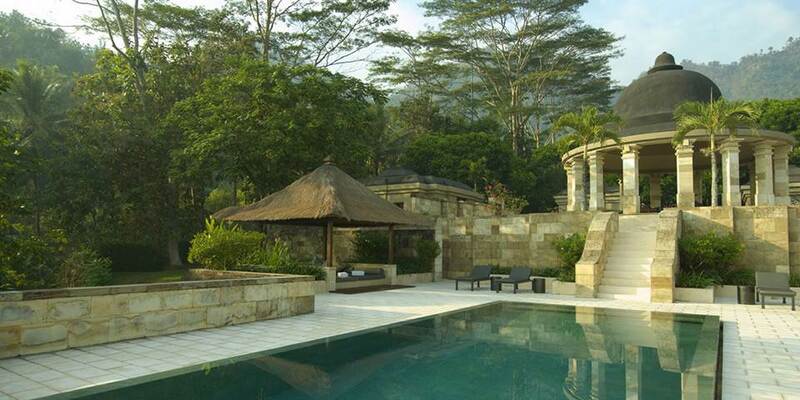 In addition to these 7 Garden and 7 Borobudur suites also feature private pools. For complete privacy the two bedroom Dalem Jiwo Suite is in a discreet compound with its own 15 metre private swimming pool. A personal butler is always on call to attend to guests.